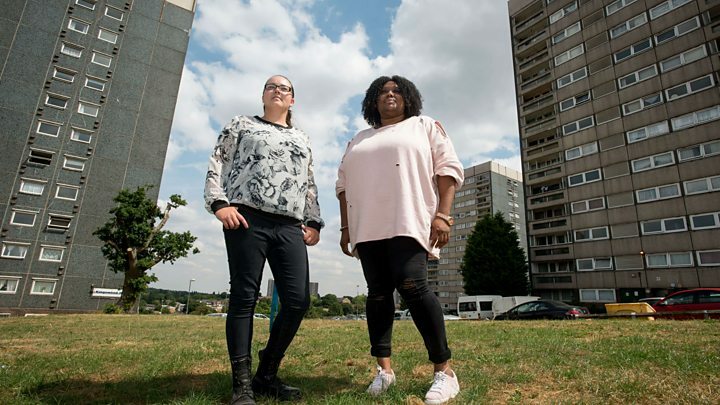 Three tower blocks could be saved from demolition after residents told a council they did not want to move out. People living in the blocks in Druids Heath, Birmingham, told the city council they wanted their homes to be refurbished rather than bulldozed. The council has put together a proposal to do just that as part of its redevelopment plan. All residents concerns have been taken into account, the council said. The tower blocks were built in the 1960s. The area's 15 tower blocks have fallen into disrepair, the local authority said. In 2017, a consultation was launched for residents to share their thoughts about the state of the blocks with the council and more than 1,800 responded. Three options were put forward, with different levels of refurbishment, demolition and re-housing suggested. A total of 88 percent of residents from the three blocks Parker House, Middlefield House and Harrison House, told the authority they did not want their homes to be knocked down, but for them to be rejuvenated. The majority of others in the remaining blocks said they would prefer to be moved out, the blocks demolished and be re-housed, the council said. The authority will put forward its proposals at a meeting of its full cabinet in October. Proposed works would include re-roofing, structural strengthening, new windows, balcony enclosures, external wall insulation, communal decoration and a review of the heating, the council said. Clive Skidmore, the council's assistant director for housing development said the aim of the plans was to make sure modern and efficient housing continues to be available for all citizens. "Where there is a need for re-location, we will work closely with council tenants to ensure that they are suitably re-housed", he added.